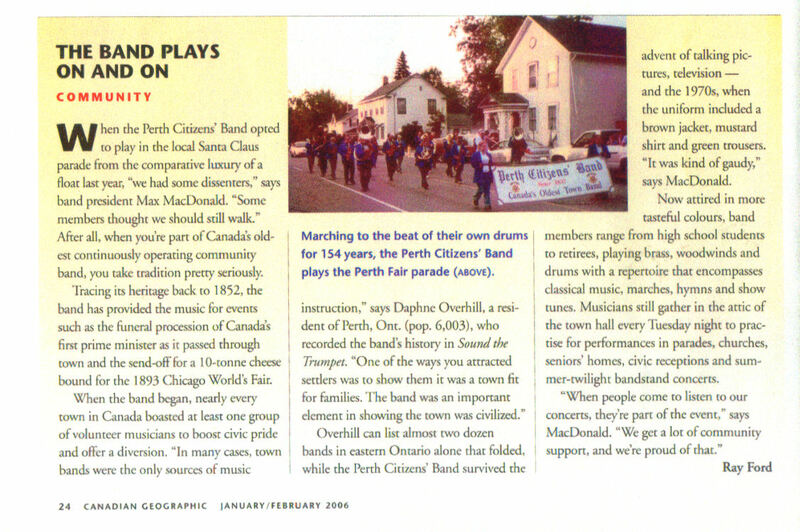 The Perth Citizens’ Band is the longest continuous running Town Band in Canada dating back to 1852. If you have basic music reading skills and want to play an instrument, we invite you to join us. Don’t have an instrument? We may have one for you! There are no dues or costs to members. Practice nights are every Tuesday from 7:30 p.m. to 9:30 p.m., at the Perth Town Hall, 80 Gore Street East, 2nd Floor, Band Room, up the stairs from the east side door. The Band has begun an exciting 2019 season which includes our regular Spring, Summer Pops, Parades and Christmas Concerts. We welcome any donations from the audience during our performances. 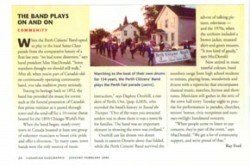 Donations are used to assist us in purchasing new music, repairs to instruments and upkeep of uniforms.